In a joint release over the weekend the MAS and SGX stated “This will help simplify post-trade processes and further shorten settlement cycles,” The DvP system operates with payment and product changing hands simultaneously ensuring that securities are delivered only when payment is made according to reports. The system has been developed along with technology partners Anquan, Deloitte and Nasdaq. Prototypes of the DvP have already shown that settlements can be made in various digital tokens on different blockchain platforms. An industry report detailing payment settlement using smart contracts has already been published by the MAS and SGX. The project was originally announced in August as a spinoff from another project, ‘Ubin’, a collaborative project with the financial services industry. It comes just days before the Singapore FinTech Festival 2018, which runs from November 12 to 16. It is expected to have over 250 speakers, 450 exhibitors and nearly 40,000 participants at the event. The city state recently held Crypto Expo Asia, an event solely focused on cryptocurrencies. 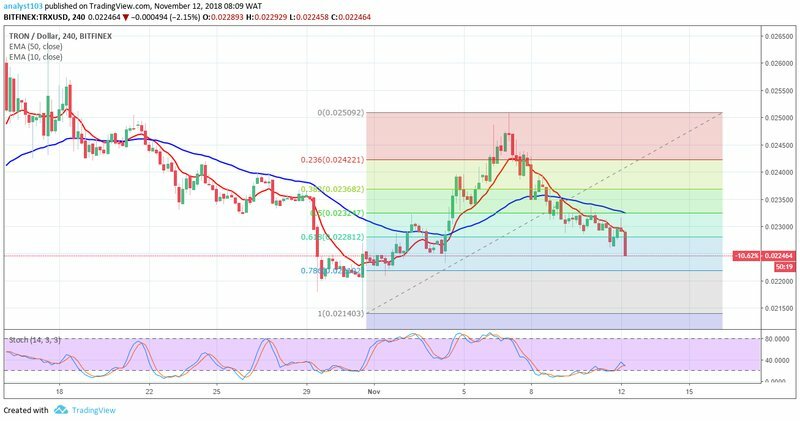 TRX continues in a bearish trend in its medium-term outlook. The bulls attempt for an upward price movement was rejected at the EMAs. The 10-day EMAs serve as resistance, particularly on 11th November. The bears return was signalled by the inverted bearish hammer. With the increased momentum the bears continue the nice journey south with the break at the 61.8 fib level. TRXUSD went down to $0.02261in the demand area same day. The brief bullish pullback saw the price back up at $0.02292 late yesterday and briefly after today’s opening as TRXUSD went up to $0.02315.in the supply area. The close of the candle as another bearish inverted hammer brought the bears with stronger pressure. The price is currently down to $0.02243 with room for more downward movement. The price is below the two EMAs and heading towards the 78.2 fib level The stochastic oscillator is at 27% and its signal point down which suggests downward price movement due to the bears’ pressure in the medium-term. A break and close below the 78.2 fib level may open the gate for a 100% retracement at $0.02140 in the demand area in the medium-term. The cryptocurrency in a bearish trend in its short-term outlook. The strong bear pressure attained the first target at $0.02240 in the demand area after earlier today. This implies that the bears’ next target low at $0.02200 may be attained shortly in the demand area. The price is below the two EMAs and the stochastic oscillator in the oversold region at 13%, with its signal pointing down. This suggests a continuation of the downward journey as the bears increase their momentum. A major talking point since the launch of the Bitcoin Core client, the bull run of 2017, and centralized custodial services has been user design. Many native crypto products are clunky and light years behind the sleek, blue-and-white aesthetic of the Twitters and Facebooks of web 2.0. And if grandmothers are the metric for adoption, there are still very few who could comfortably send Christmas bitcoin to their grandchildren. There are many people, however, who are capable of tweeting and posting from their phones by leveraging current technology rails. Bridgeware is the collection of Frankenstein products or services that help meld two generations of technology together. They are incredibly important for many reasons, but mostly in their ability to maintain an ecosystem gain exposure. Some end up getting absorbed by fast-growing conglomerates, while others disappear once enough people have crossed the chasm. They are solid short-term bets that most anyone can conjure up as founders needn’t reinvent the wheel. They add a few extra spokes or new trim. In the words of Peter Thiel, commentators could consider these items as moving from one to two, rather than the coveted Zero to One. The easiest way to identify such a company is paying attention to the hijacking of turns of phrase, aesthetics, or functions. Quickly examples like “Uber, but on the blockchain” or “think beanie babies, but digital,” and one can begin to get the picture. Bridgeware services are boundless, far-reaching, but often not forward-thinking enough to spark the fuel of revolution. They still serve, however, an incredibly valuable function, especially in the crypto community. Coinbase is likely to be the most significant example of Bridgeware. It rarely differs in its semantic choices from banks and pre-Bitcoin financial institutions. They also employ the same high-quality user-experience as Facebook and the gang. Ultimately, the killer combination has convinced at least 13.3 million users to join the service as of November 2017 according to data from Alistair Milne of the Altana Digital Currency Fund. Herein lies the power of these bridging services and their role in mass adoption. It’s difficult to convince someone that they should be their bank. Explaining the fact that they could securely store billions of dollars in value on a USB-like drive in the desk drawer takes a clever bit of persuasion. Put otherwise, explaining the means in which a user would need to keep that store of value safe from malicious folks is probably Coinbase’s greatest sales pitch. Combining Satoshi’s vision with that of someone looking to continue moving around their friction-free financial day is a tough ask. But that doesn’t mean that these people shouldn’t, or can’t, be exposed to the world of cryptocurrencies. In a series of announcements, Zulu Republic, launched multiple apps that hijack Facebook’s and Telegram’s messenger to send litecoin (LTC) anywhere in the world. If a participant doesn’t have access to the Internet, they can also send LTC around via SMS text messages. The Zug-based group released LITE.IM to show users what a future of micropayments could look like via common communication rails. This app immediately exposes a massive audience to LTC, the merits of uncensored value transfer, and does it all via legacy channels. In a second example, CoolWallet attempts to lure users by creating a bridge between crypto and the aesthetic of debit cards. 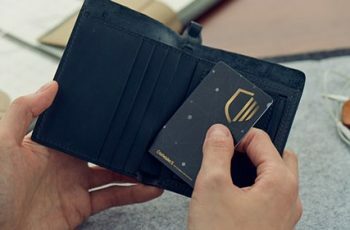 Their CoolWallet S has released “the world’s thinnest cold storage wallet” and supports bitcoin (BTC), ether (ETH), litecoin (LTC), ripple (XRP), bitcoin cash (BCH), horizen (ZEN), and an assortment of ERC20 tokens. Throughout their website, the company lays out how one can combine the security of a cold storage wallet with “on-the-go” capabilities. The device is frequently placed alongside traditional wallets to imply the connection to a debit or credit card with which users are already familiar. The device comes with an app that helps to manage users’ holdings which are connected via Bluetooth to the CoolWallet S. The device also provides a small screen that displays holdings in any the cryptocurrencies. The corresponding app offers a Changelly function to switch between cryptocurrencies as well as a relatively user-friendly layout which shows all holdings on the card. To send a transaction, a user would use the app similar to any other crypto wallet application, but the transaction is ultimately verified with hardware wallet. By pressing the button on the card, one can confirm the operation. The app also offers an interesting level of security using Metacert to prevent phishing attacks. The arrival of Bridgeware is a contentious subject in the crypto space. When products are released that don’t uphold the original tenants of decentralization and autonomy, they are quickly torn to shreds. Unfortunately, there is a reality that needs serious attention. 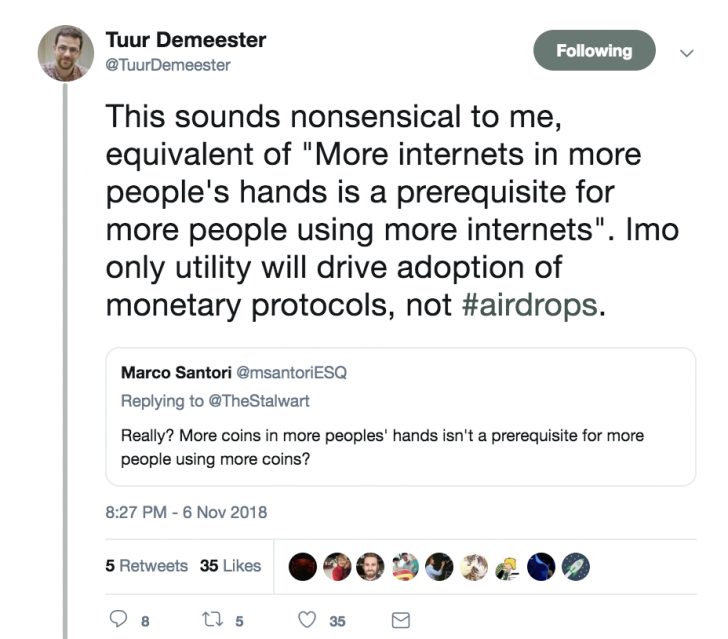 Onboarding more users, merchants, and payments processors likely mean a scaling down of the crypto-anarchist narrative. 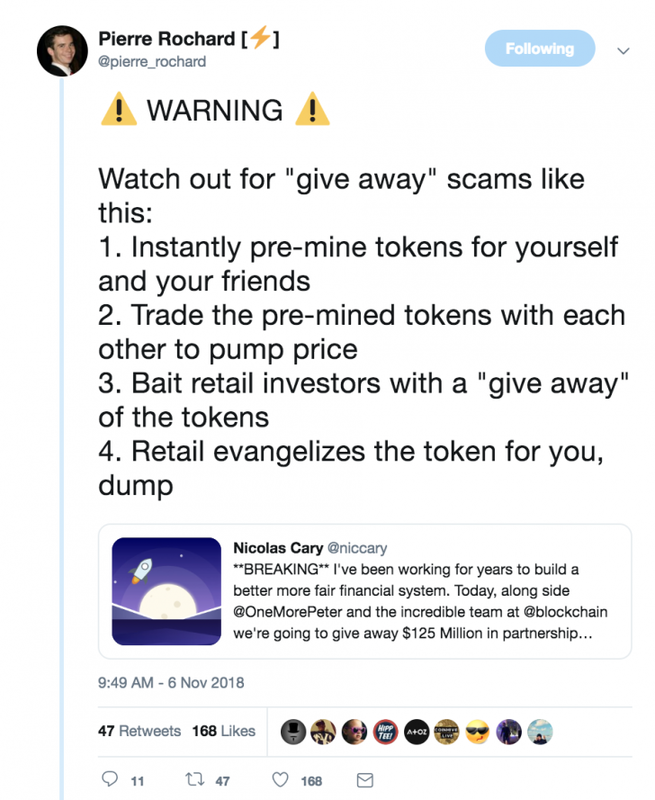 Solutions like Trezor and different tip bots do already exist, and they serve different end users. The two services, however, do not run in competition with one another. The former is arguably a crypto-native product, while the latter is just the onboarding service with which Internauts can experiment with the eccentric futures of value transfer. In the end, both are incredibly important. Arriving at a secure cold storage service for one’s holdings only makes sense if one has already encountered cryptocurrencies in the first place. Thus, the case for Bridgeware is a strong one, but hopefully, the industry doesn’t give up on building out a native world to host digital assets. Full Disclosure: At the time of press, the author has holdings in litecoin (LTC). CoolWallet sent the author a test product for this review; no other compensation was incurred for the writing of this article.